The sculpture creates a visual landmark expressing the sense of optimism and hope provided by the Institute. It provides a gateway and symbol for the campus. It is intended to be a rigorous piece of art and, although it is abstract, it has a figurative quality that crosses the boundaries of culture and age. It is intended to be inclusive in its message and clearly readable. It has a movement and dynamism that throws off vivid colors, which are intended to inspire and be uplifting. 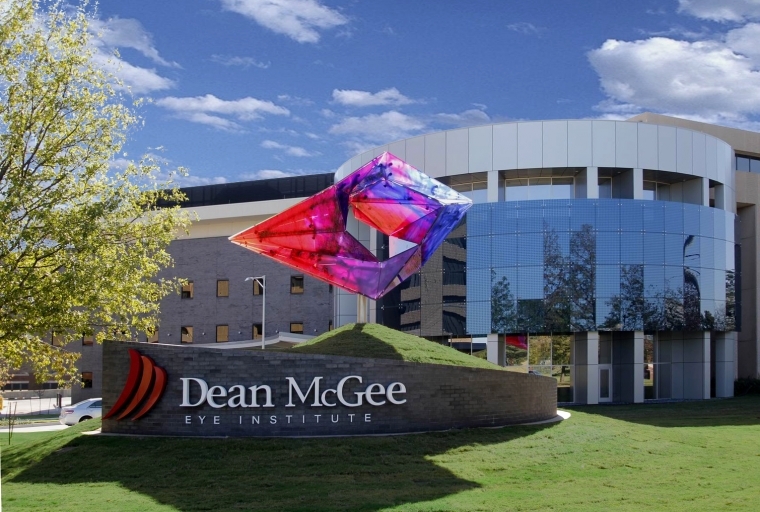 It uses the principles of refraction and reflection of light, like a glass prism, and displays the spectrum of colored light to create a symbol for the institute. The colors are constantly changing with the natural light and movement of the sun. At night it acts like a lantern or beacon - a representation of the institute as the world center that it is and as a symbol of hope. The design is an abstract representation of vision. It is based on a stylized form used to represent the human eye, that is found as far back as Mesopotamian art, later refined and stylized in Egyptian hieroglyphs and engraving, and is still used today. This abstraction of a figurative motif is now universally recognized as a symbol for sight and vision. The design also goes further because it uses the basis of vision – light and its refraction into the color spectrum. It uses color and natural light as a metaphor connecting nature and artifice. The colored glass reflects and transmits light, casting fragments of colored patterns around it and reflecting sunlight sparkles.